By David Salvi on Thursday, July 16th, 2015 in Market Trends, New Homes. New residential developments which were offered across our area in the first half of 2015 provided buyers with choice in a market that has a shortage of second hand properties. Visitor numbers to new homes sites bounced following the election result to provide a strong end to the first half of 2015. As reported in our 2014 report house builders and private developers continued to offer new homes to the local London market before targeting buyers at overseas sales exhibitions. This policy continued in 2015 and produced a steady rate of sales across Midtown, City and Docklands. Across our areas there are some major residential and mixed used developments under construction. 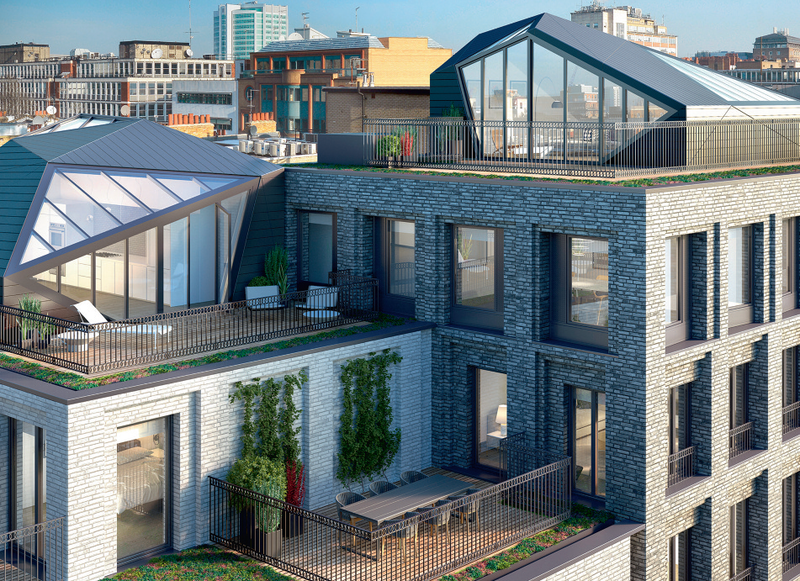 Midtown, Fitzrovia and Kings Cross continued to see a high number of quality developments come to the market with the first completion at Fitzroy Place now expected in the autumn of 2015. On 10th June we released the first phase of The Corner House, Charlotte Street W1 for Derwent London. The 9 apartments have been designed by DSDHA and will be ready for occupation in Q4 2015. Pricing for the two bedroom apartments started from £1,750,000. In January, developer, Almacantar, began the transformation of Centre Point WC2 from office space into luxury residential. Centre Point, which rises above the junction of Oxford Street, High Holborn and Tottenham Court Road, will be converted into 82 apartments and 41,780 sq ft of retail space and will be completed in 2017. It was reported that the most expensive penthouse is to be priced at £55m – a 7,333 sq ft five bed duplex. One bedroom apartments of 744 sq ft are priced from £1.8m. This iconic London building sits above the new Crossrail Station and sales are expected to be to predominately overseas buyers. In Clerkenwell at River Street Mews EC1,Tasou Associates and Kinnersley Kent Design proved that UK buyers will pay premium prices for high end boutique developments. 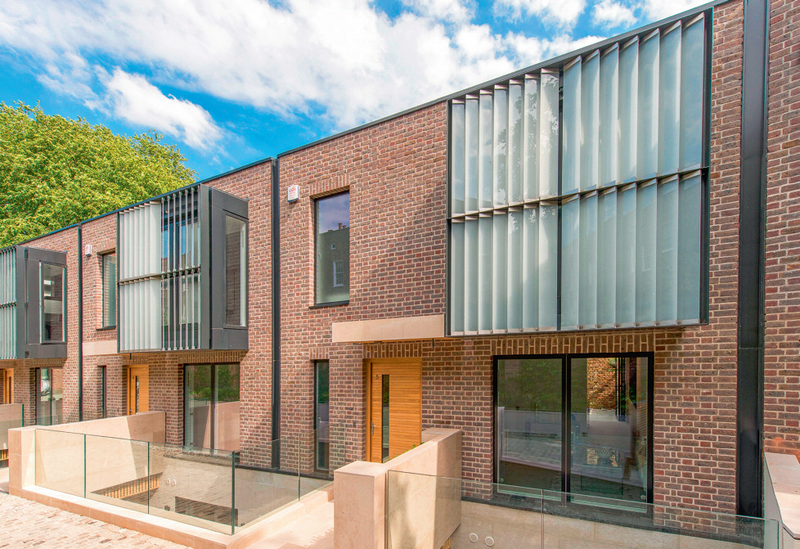 River Street Mews is a development of 6 new houses with superb roof terraces off Amwell Street. Exceptional design and finishes secured prices averaging £1,300psf. At 250 City Road EC1 directly opposite the new luxury towers of Canaletto and Lexicon, Berkeley Homes launched another major mixed use development in the UK from their marketing offices at Goodmans Fields in January 2015. Prices for studios started from £650,000, one beds from £875,000, two beds from £1,325,000, three beds from £1,650,000 and an average of £1,270 psf. By mid-year the former light industrial units had disappeared and marketing was in full swing. The scheme comprises of four blocks of between 7 and 9 storeys plus two towers of 42 storeys each. In total there are 798 private apartments plus 132 intermediate social apartments, a 190 bedroom hotel, cafes, restaurants, retail and offices and extensive landscaping over a 2 acre site. Completion is expected from 2018. By midyear Crown House another 80s red brick office building had disappeared from the junction of East Road and City Road to make way for Atlas a 39 storey building that will tower above the neighbouring 24 floor Montcalm Hotel and the newly completed Eagle. Atlas will comprise of 263 private apartments, offices and retail by Rocket Investments. Marketing commenced in April in the Far East and in the UK. Shoreditch is set to see major new developments continue to regenerate and repopulate this part of the City with a number of high quality residential developments including high rise living planned to transform the area further. The largest site is at The Bishopsgate Goodsyard comprising of 10 acres next to Shoreditch Station where the owners Ballymore and Hammerson are due to submit a substantial ‘tech – focused’ planning application that includes 1,346 new homes, warehouse style offices and up to 100 new shops plus a 2.4 acre elevated public park. Plough Yard Developments has secured planning on The Stage the site of London’s second oldest theatre that once played host to Shakespeare’s theatre company, the Lord Chamberlain’s Men and staged the first ever production of Romeo and Juliet. The development will includes 385 apartments in a 40 storey tower, 250,000sq ft of office space, 27,000sq ft of shops and retail on a 2.3 acre site bounded by Curtain Road and Great Eastern Street. At the same time Manhattans’ largest hotel operator Highgate Holdings secured planning in the first half of 2015 for a 200 bed hotel at 201- 207 Shoreditch High Street, including offices, retail and leisure space. This Stage will follow Principal Tower designed by Foster + Partners. Construction commenced in Q1 2015 for a 50 storey tower within the mixed use development at Principle Place just to the north of Broadgate. It is rumoured that 120 units out of 273 private apartments have been reserved at prices averaging £1,500 psf. At Aldgate where we open our 6th office in September at 61 Alie Street E1, British Land and Barratts are on site at Aldgate Place comprising of three towers of 22, 25 and 26 storeys and a series of lower buildings ranging from 6 to 9 storeys. Aldgate Place will include 463 private and affordable apartments, together with office, hotel, retail and leisure uses around a new pedestrianised street linking Alie Street to Aldgate Station. 25% of the private apartments were sold by the half year with one beds from £688,000, two beds from £809,000, three beds from £971,000 and averaging £1,100psf. 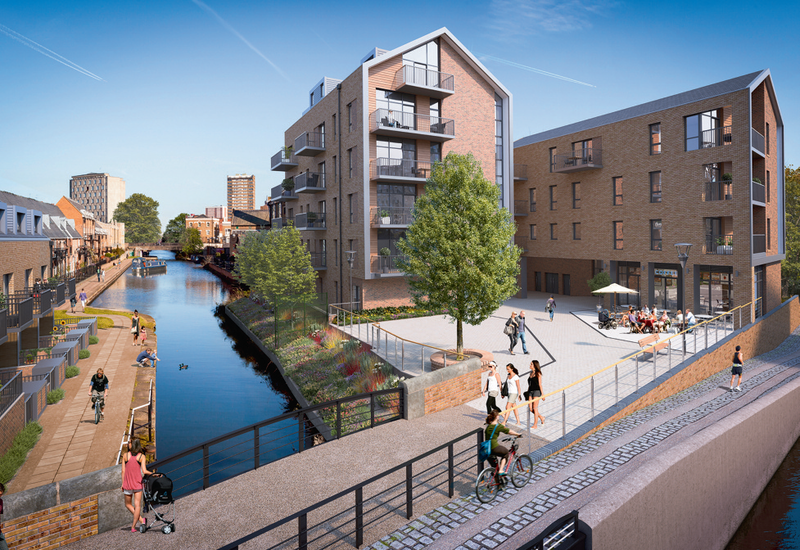 Further East we Iaunched a development of 19 new apartments and 5 houses at Bow Wharf E3 where the Regents Canal and The Hertford Union Canal meet at Victoria Park on behalf of Bloc (British Waterways) and Rooff. 90% of the units were reserved at launch in May 2015 at prices averaging £840psf. At Shadwell we launched 28 apartments at The Junction, Shadwell E1 for Telford Homes with 50% reserved by the half year and completion due for Q3 2016. Two bedroom flats are starting at £540,000 for £780psf. Ballymore launched Phase 2 of its London City Island scheme at Canning Town at the end of May with one bedroom prices starting at £375,000. At the same time The English National Ballet and English National Ballet School, which currently operate from separate sites in different parts of London, announced plans for a new joint home at City Island which will form an emerging creative and arts cluster. The purpose-built facility is scheduled to be ready in 2018. In June the Canary Wharf Group commenced first phase marketing of 345 apartments at 10 Park Drive, Wood Wharf E14 with prices commencing from £495,000 for one bedroom, £795,000 for two bedroom and £1,295,000 for three bedroom apartments. The launch on 9th July promised to give priority to UK buyers. In total 3,200 homes will be built at Wood Wharf. Galliard also launched 297 apartments at Maine Tower a 42 storey luxury tower part of Harbour Central at South Quay E14 on the last weekend of June at prices starting £900psf. In total, Harbour Central will offer an exemplary choice of 642 private apartments, providing a range of highly-specified studio, one, two and three bedroom apartments along with eight penthouses and elite lifestyle facilities; with the leisure complex set to include a “Resident’s Club” with a proposed library, concierge, gym and spa, business suites and cinema. The number of new homes under construction across London has doubled since the last peak in 2007. The increase in supply is likely to keep a lid on further prices rises in the next 20 years as the market will need time to absorb the thousands of new homes currently in the construction pipeline. As outlined above buyers have a wide selection of new luxury apartments to choose from across a range of areas with the promise of stunning views, high quality finishes and superior levels of services. At the same time in June The Mayor of London announced plans for a New Homes for London Agency to help deliver housing and infrastructure for London. The Mayors office will gain new powers and it will bring City Hall closer together with the London Boroughs to increase the pace of housebuilding in the capital and help release public land. This move has all-party support and will hopefully be operational and start producing tangible results before a new Mayor is elected in 2016. Late in 2014, the government introduced the Vacant Building Credit (VBC). It could significantly reduce the development costs on some sites by reducing the obligation to provide affordable homes. VBC was designed to encourage developers to bring vacant buildings back into use, or demolish and rebuild them. By reducing the obligation to provide affordable housing, the development becomes more financially viable. VBC applies only to sites that include buildings which have been vacant for a period of time. The planning authority should calculate the number of affordable homes that would normally be required to obtain planning consent and then deduct the number relating to the gross floorspace of the previously existing vacant building. In London this has meant windfall gains for developers who happen to be redeveloping land with vacant buildings which would in any event have been financially viable. For local authorities in Central London it represents the loss of much needed contributions to affordable housing.